It was another week, another try, another reason for Kick This to kick balls and place them into the gaps of our enemy's defense. We never knew... that our gaps would be the ones taken advantage of. Yes, the enemy put balls, many balls, in our sensitive areas and laughed, ney! cackled as they did so. Which brought up flashbacks. Like my ‘Nam flashbacks but with less junglescapes and Lady Gaga references. Yes, it's been a long while since I heard a cackle, it brought me back to that time... when I purchased Magnum condoms at the local pharmacy and the cashier.. with her pasty white skin, blonde hair pulled back into a tight bun, and through her yellowed cigarette stained teeth... Cackled at my overly optimistic wiener guesstimation. It burned me, I was so, so young and nubile. 27 is a hell of an age to hear that, cuts you deep, right to the non magnum sized (but still totally gets the job done, I mean honestly, most feedback forms give 3 stars or above) wiener. Where were we? Oh yes, the game. Well, it started off meagerly against Booze on First, as in only bout 8 of us showed up. We stalled for time, hoping more would show. We gave them riddles (but they can barely read) we gave them a Rubik's cube (but they tried to eat it) finally we gave them shiny things, oh yea, that’s the ticket. The game began, Booze on First kicking and us… with 3 open slots in the field, their balls fell easily upon the grass, scoring 4 in the first inning. We again had trouble making foots + balls = runs, even with others showing up to give us a full roster. Their balls, their balls, their mighty red bouncing balls.. kept falling around us, it was merciless. They scored 12 runs to our 2. However, this.. this was a trap. Oh yes! For we wanted them to keep on scoring. 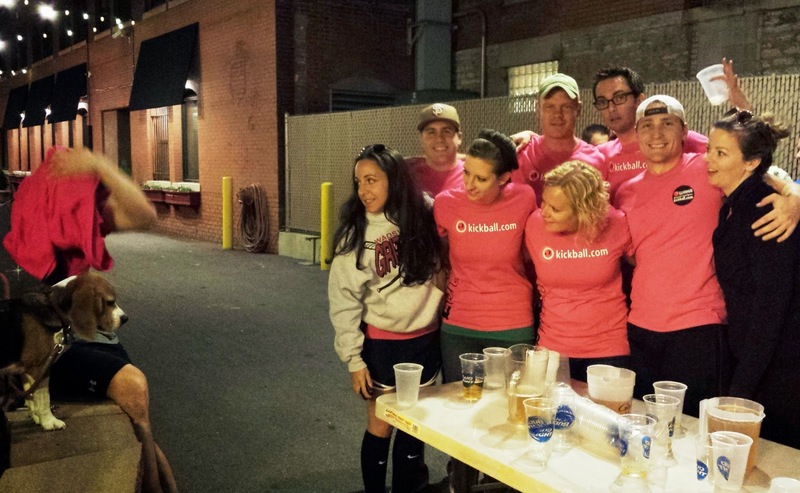 We had them run the bases, over, and over and over over over again so that they were too tired to play at Flip Cup. Exhausted from all repeated scoring, they didn’t have the strength to show up at Darby’s. With their non presence upon the dueling flipping table, we claimed the real prize, a W in the Flip Cup column. We played them well with the long con, for we are.. True Champions! They can have their kickball victory, suckers.